It’s National Cancer Survivors Day this Sunday, June 5th and we’re highlighting the important role cord blood and stem cells have played in helping increasing numbers of people survive cancer. Cancer comes in many forms and in days gone by a cancer diagnosis was almost certainly terminal. Thankfully, medicine has advanced and today there are more cancer survivors than ever before. One of the most important developments in treating cancer has been the development of stem cell transplants, particularly in malignancies of the blood. Stem cell transplants allow patients to undergo intensive treatments using strong chemotherapy and radiotherapy drugs. Unfortunately these drugs compromise the bone marrow (the body’s own blood cell factory) and the body needs a helping hand to recover. A stem cell transplant replaces the stem cells found in the bone marrow and allows the patient to produce blood cells to transport oxygen around the body and defend against infection once again. The very first stem cell transplant was performed by DR. E Donnall Thomas in 1957 . The transplant involved identical twins, one healthy twin who donated stem cells to the other twin who was suffering with leukaemia . Siblings have played an important role in the development in transplant medicine. Not only was the very first stem cell transplant performed with identical twins but the very first successful allogeneic transplant was performed with siblings in 1968. The transplant used the bone marrow donated from a boy’s sister who had an immune deficiency which had killed other members of his family . Siblings also played a role in the very first cord blood transplant which treated a boy with Fanconi Anaemia with his sister’s cord blood in 1988. The advancements in the detection and treatment of cancers have had a direct impact on survival rates. 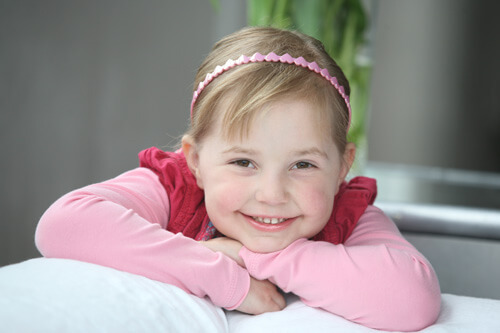 Acute Lymphatic Leukaemia is the most common childhood cancer, accounting for approximately 75% of all childhood cancer diagnoses. A study by the University of Colorado Cancer Center found that in the 1960’s the 5 year survival rate of children and adolescents with ALL was less than 10%. Fast-forward to 2012 and the survival rate is more than 90%. Cord blood banking has also played an important role in helping to increase the amount of people who have become cancer survivors. 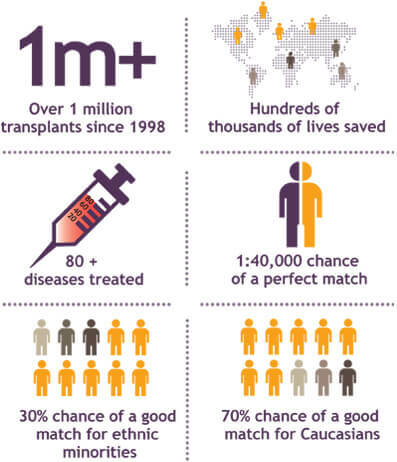 Donated cord blood has helped save and extend the lives of many people who have needed stem cell transplants, it has help in research to develop new treatments and therapies. 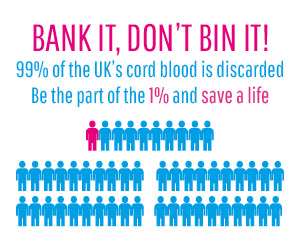 Privately stored cord blood has also helped save the lives of people with cancer, providing families with a stem cell match when they have needed it most. This National Cancer Survivors Day be Cord Blood Aware, talk about cord blood and let people know it doesn’t have to be thrown away.